Zen Studios is best known for its prowess in the pinball market, amassing its fame from titles such as Pinball FX, Zen Pinball and Marvel Pinball (Notice a trend?). This success has enabled Zen to expand its creative department and develop a wide range of games for varying platforms. KickBeat, for example, is a music-based crossover action title for Vita that throws a brilliant twist into the tired rhythm genre. It combines the quick dexterity of classic rhythm games with a few of the industry's favorite tropes and trends: fighting and ninjas. The most noticeable fad that Zen Studios doesn't integrate in KickBeat also happens to be the game's best feature: It has absolutely no touchscreen or rear touchpad functions. With a foundation of rhythm games and ninjas, KickBeat could easily turn into a campy, kitschy mess, but Zen Studios successfully balances serious marital arts with light-hearted design. KickBeat is, at its heart, a traditional rhythm game that has players tap the square, circle, triangle and X buttons at certain times in various levels, to the beat of licensed songs. How this tapping is visualized is where the revolution begins. Rather than placing notes on a rolling track for players to hit as they reach a checkpoint, KickBeat has a martial artist in the center of a ring of angry, masked foes. 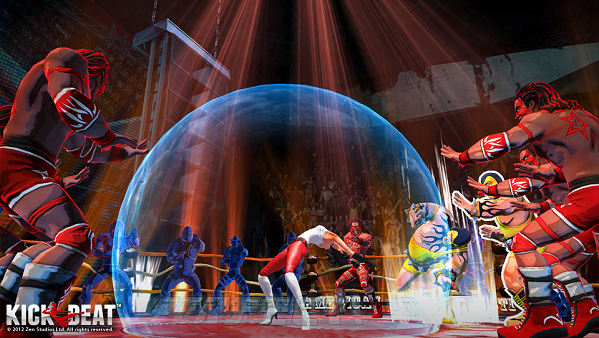 The enemies rush in from four directions and as each one reaches the edge of the ring around the middle character, the player hits the corresponding button to kick or punch him. I played the first two rounds on normal difficulty after watching a developer play an advanced level, and just like most rhythm games, KickBeat is harder than it looks. Enemies circle the center character in an ordered frenzy that is just precise enough to function as a solid "tap here now" display, and as they build up speed and introduce new patterns the challenge is extremely satisfying, mirroring that of Guitar Hero, but exclusively for your thumb. As each enemy is taken down, KickBeat manages to retain the feeling of an action game. Every time I missed a tap and an enemy hit me I felt the damage like a small-scale blow in Marvel vs. Capcom 3. Differently colored enemies have different functions, with red dudes signalling the player to press two buttons at once, and those chained together with a yellow trail mean "hold on the first, release on the second." Tap twice on enemies with icons over their heads to gain whatever goodie they have to offer. KickBeat has depth. Played to a soundtrack featuring Marilyn Manson, Rob Zombie and Pendulum – "The stuff we liked in college," Zen's Mel Kirk says – among others, KickBeat succeeds as both a rhythm game and a fighting one. KickBeat succeeds as both a rhythm game and a fighting one. And then it gets interesting. The soundtrack for KickBeat is fine, but it doesn't really matter if you're down with "The Beautiful People" in the long run. The game allows players to directly upload and play with their own music collection, similar to principles in Audiosurf. Zen Studios spent one year creating its own song-determining technology, which is "probably some of the best in the world," creative director Neil Sorens says. It doesn't use an algorithm to guess the rhythm of new songs, but instead has the player tap the tempo into a calculating tool and add customization options, such as the number of enemies and difficulty settings. I didn't get to play with the personal music integration, but if it works as well as the in-game songs, KickBeat will be a brilliant game for Vita, acting as an iPod with a thrilling, integrated rhythm-action game. KickBeat is poised to launch in late fall or early winter this year.